Managing Anxiety with Mindfulness For Dummies is a practical guide to overcoming your worries and minimising anxiety using mindfulness techniques. The National Health Service and the National Institute for Care and Excellence recommend mindfulness as a legitimate treatment for anxiety, and its also been proven to alleviate stress, depression, low self-esteem, and insomnia. This book explains the benefits of mindfulness, and how it can help you face your fears and defeat persistent, irrational worries. Learn how to break the anxiety cycle with an optimistic approach, live in the present moment, and manage your thoughts using the fundamental techniques of mindfulness therapy. This friendly guide will accompany you every step of the way as you understand your anxiety, identify solutions to your problem, maintain your gains, and avoid relapse. Over three million people in the UK suffer from Generalised Anxiety Disorder, with millions more experiencing phobias, OCD, and panic disorders. Anxiety is potentially debilitating, but many people are daunted by navigating the health system and thus fail to seek treatment. This book provides a way for you to begin managing your symptoms at home, using simple techniques that can help change the way you think, feel, and act. Mindfulness can help you break free of the downward spiral of negative thought and action, and make positive choices that support your wellbeing. 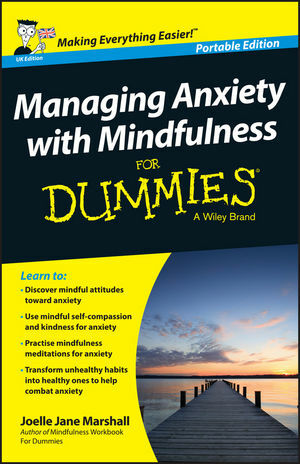 If you're tired of being anxious and long for a brighter outlook, Managing Anxiety with Mindfulness For Dummies provides a wide range of effective techniques to help you enjoy a calmer and happier life. Joelle Jane Marshall is a freelance speaker and mindfulness coach who works closely with fellow Mindfulness For Dummies coauthor Shamash Alidina on workshops for 'Mindfulness and Overcoming Fear'. She trained in mindfulness with Shamash and meditates and practices yoga regularly.